enabling them to start, restart and rise in their careers. Our vision is to enable women to achieve their full potential. women returnees, with a culture of high ownership, deep accountability and inclusive support to one another. Neha Bagaria is the Founder & CEO of JobsForHer, an online portal to enable women to start, restart and rise in their careers by connecting them with jobs, reskilling, mentors, community and inspiration. After graduating from the Wharton School of the University of Pennsylvania, Neha founded her first company Paragon, to bring the Advanced Placement program to Indian high-school students. When marriage brought her to Bangalore, she started working with Kemwell, a contract pharmaceutical manufacturing company, in the fields of HR, Finance and Marketing Strategy. Neha took a 3.6-year break in her own career when she had her children. During this personal journey, she became aware of the various difficulties a woman faces in order to re-enter the workforce. She then became committed to the cause of enabling women to achieve their potential and founded JobsForHer.com on International Women’s Day, 2015. Neha has been featured in the Forbes India’s list of “25 Women Trailblazers” who are shattering stereotypes and in “19 Changemakers to Watch Out For in 2019” by Deccan Herald. Neha is an entrepreneur at heart, a mother to two boys, an avid reader, a closet dancer and a travel enthusiast. Harsh has over 12 years of rich and diverse start-up experience, having conceptualised and delivered multiple products successfully. He has been actively involved with very early stage start-ups in building teams, architecting solutions and delivering products in Education, Finance, MMOG domains across Web and mobile. 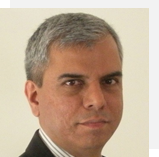 At JobsForHer, Harsh leads the technology initiative and is responsible for the product roadmap and its delivery. In his last assignment as Co-Founder and Head - Product & Engineering at MobiCom, he was responsible for leading a team of developers to deliver a product that was already deployed in over 50 clubs in 10+ countries. Previously, as Head of Engineering at Simplilearn, he was responsible for the design, development and delivery of all the client facing products on web and mobile. At Sakhatech he has been a tech evangelist and had led its opensource web technologies team (LAMP stack, Mongodb and Ruby) as well as the products development group. He brings rich experience from his earlier stints at Guruji and Buzzgain where he worked with very large and unorganized real-time data. Harsh holds an Engineering Degree from NIE, Mysore. Apart from a keen interest in upcoming technologies, Harsh is a foodie and a movie buff. He actively supports social and community initiatives and is closely involved with LifeCraft, a not-for-profit organization involved in creating sustainable livelihoods in villages which do not have any alternate sources of employment. As AVP of Marketing, Priyanka Ganapathy oversees the implementation and execution of digital marketing initiatives, enhancing brand awareness and empowering all channels to grow revenue. Priyanka works closely with both public relations and digital team members at JFH to effectively deliver comprehensive, fully integrated campaigns. She and her team thrive on developing creative and engaging programs to build the JFH brand and bottom line. Priyanka is from Bangalore and graduated from Macquarie University Sydney with a duel Masters in Biotechnology and International Business with an emphasis in Marketing. Priyanka brings over 11 years of experience to JFH, with challenging roles at leading companies including Biocon, Aurigene Discoveries and Technologies and The Times of India group. Senior business professional with over 18 years of experience in developing new business through relationship management, account development and sales team leadership in the recruitment, business strategy, brand consulting and people strategy domain. Maximise profitability within sales organisation by segmenting markets, driving winning campaigns, maximising profitability and engaging team members. Exceptional mentor and coach; combine business acumen with innate leadership abilities to recruit, build and retain top performing sales teams. Appointed to drive new business development, offer strategic advice, insights for market differentiation, competitive advantage and go to market strategies with full responsibility for bottom-line factors, product development, and client relationships. Schonali Rebello began writing stories at the age of 7 and became a feminist a little earlier than that. She discovered that that’s what she was in Women’s Studies 101 during her first year at Knox College, IL, USA as a Creative Writing major. That class, which she took randomly for a credit, le d to a deep-rooted love affair with the subject and to it becoming the other half of her double major at Graduation. A xennial constantly moving countries all through childhood and adolescence due to world events like The Gulf War, and family events like her mother becoming the EA to India’s biggest tycoon in a newly emerging Indian economy, Schonali thrives in chaos, upheaval and turbulence. She is an articulate, engaging communicator with finely-honed relationship management skills, who readily establishes rapport and trust with people from all backgrounds and interests. She also brings an astute understanding of the unique perspectives and values of intercultural demographic groups, given her smorgasbord track record in the fields of sales, marketing & event management in industries as diverse as hospitality, F&B, coffee exports, fundraising for the performing & cultural arts, and IT. The writing skills came in handy for them all. With 3 career restarts, 4 country relocations before marriage, and an indefatigable fire in the belly to change the world for and with her son, Schonali is now a founding member and the Head of Creative Content at JobsForHer – a portal that brings women back to work after a break, in India, connecting them with companies who want to hire them. There, she and her team craft beautiful content into compelling content that sells. 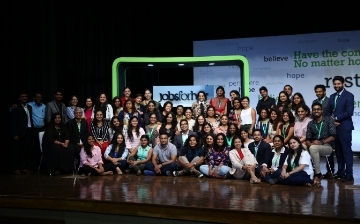 A firm believer in the value and beauty of education gleaned from every experience, connection, and challenge, she has found her calling with JobsForHer, which is the perfect bridge between her capitalist mind and socialist heart – a socio-economic revolution that is bringing women back to work, across India. A self-starter, strategic thinker and an experienced media professional, Sowmya believes in driving business growth and product innovation by adopting a mix of user analysis and creative approach. With a diverse background in Marketing, Strategic Alliances, Communications, People Management and Film Making, she started her career in the space of advertising and film making, where she was introduced to a creative rendition of business ideas early on in her career. The arrival of her newborn led to a break in her career and the genesis of her start-up, FoodTribe – a platform to bring artisanal food to food lovers. Being part of the founding team at JobsForHer, she has straddled multiple hats and has handled diverse functions and now heads Strategic Initiatives at JobsForHer. Sowmya is responsible for building a robust ecosystem for women to grow professionally by building communities, connecting with reskilling partners, hosting events, fostering mentor networks, and creating opportunities for furthering business growth for a cause that is extremely close to her heart, which is, helping women start, restart and rise in their careers. An IT professional till 2017 with her core compentencies in Project and Program management – she headed some of the big portfolios in the top IT companies like ANZ and Capgemini in India. She always had a special interest in helping women grow in their careers and hence, had been a mentor to many women. She is now a designated career mentor on many mentorship portals. She was awarded at a TEDx Women event organised by the Dayananda Sagar Institutions for her 25 years of achievements in the corporate world. In her pursuit to share her experiences and learnings with the ecosystem around her, she delivers talks on a variety of topics which serve as inspiration and learning for others. She has also recently been bitten by the writer’s bug and has written a few articles, again with the intention of helping everyone learn from her experiences. I have a family of 2 beautiful daughters and 1 lovely son. My corporate journey lasted 25 years and struggled to rise in my career while raising 3 children single handedly. My career took a U turn when I started a new journey in life about 4 years back when I partnered with a friend of mine into a new venture. I found meaning and happiness in what I did. My entrepreneurial journey changed me as a woman , as a mother, as a leader , and above all it gave me clarity and purpose. I do what I do because I believe I am here to inspire , to help others change their lives while I am changing mine. 6 years of Entrepreneurship (Insighto.com and Knowience Consulting). 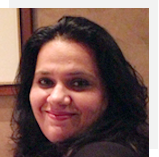 A professional in the field of Human Resources, Shubha has been passionate about fostering growth and development of people in organizations. As a young professional who joined an Indian IT firm, Shubha transitioned to several challenging and exciting leadership roles in several organizations in the 25 years that has spanned her career in HR. As a leader now of her own consulting firm she strives to provide an environment to clients which fosters actions in the transformational space through their people processes. At Hewlett Packard served as the Director of Human Resources and one of the Key Leads for Compaq integration with HP for 10 years. Was responsible for setting up the Software Development Center for HP China. At Dell (erstwhile Perot Systems) served as the VP HR for their global PSI division and lead an international HR team. At AXA Technology served as VP HR Asia Pacific responsible for India, Hong Kong Australia and Japan. At IBM as HR Manager for the IBM Global Services (erstwhile TISL). “I would like to thank JFH team for their amazing work and support, I applied using their portal for a job which provides flexibility for woman returnee and got selected. “I am pleased to share that I got placed with an IT company as a Senior Project Manager in Hyd. The role is exactly what I was looking for and I am very happy with the career lift I got after a long desperate wait. On this happy note, I would like to share my happiness to make it doubled. I got a job offer with a digital marketing training institute here in Bangalore as Digital Marketing Trainer. Women here in JFH group paved the path of patience irrespective of the experience or wait time. “Being a first time participant in this event, my experience was very nice. It was very well organised. However being a last minute entrants, my workshop details could not reach out to many people. Despite that, the turnout and feedback for the workshop was very positive. I look forward to working with you in the long run. “Jobsforher has provided a fantastic platform for women who want to Restart their career - whether in a job or as an entrepreneur. They have brought together an impressive mix of service providers, companies who can hire, HR Professionals who can Mentor all under one roof in 1-day for the 3 cities - Mumbai, Delhi and Bangalore! The Mumbai event on 1st Sep 2018 was well organised with very helpful and approachable teams. I commend Neha Bagaria and her team for living up to the spirit of their mission.